I saw Savor on display at the library and was immediately drawn to it, a collection of “rustic recipes inspired by forest, field, and farm.” So far I’ve made the homemade yogurt, cornbread, and this birchermüesli, all with great success. If you’re craving simple mountain fare, this book is for you. Put all the ingredients in a medium mixing bowl and stir well. Refrigerate overnight in tupperware. Stir again in the morning before serving. The blackcurrants are my own addition. The original recipe calls for unsweetened dried blueberries, 1/4 cup rye flakes (which I replaced with rolled oats), and freshly squeezed orange juice (I used store bought OJ with lots of pulp). I often double the recipe so it lasts me a few days. Such a beautiful website, so glad I’ve found you ! 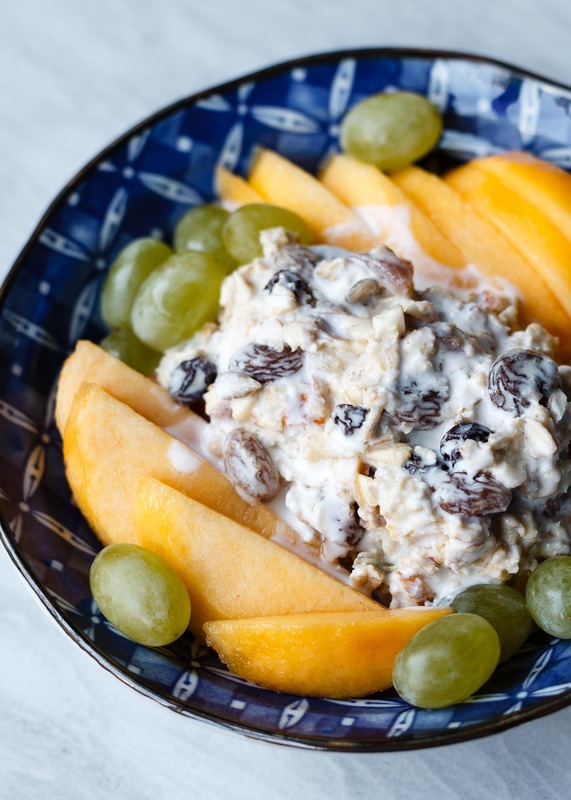 I could eat bircher muesli all year too. It’s always such a calming way to begin the day, knowing that a nourishing breakfast is already waiting in the fridge. Hope you are well, Lu!